Dill Pickles, often just referred to as “Dills”, are small cucumbers, pickled whole and unpeeled, flavoured with dill weed and dill seed. They have a sour taste, and are twice as popular as sweet pickles in America. Commercially, they are sold either whole, sliced cross-cut (sometimes called “chips”), cut lengthwise horizontally to form long flat slices (sometimes called “hamburger slices”), or sliced lengthwise into spears. There are two styles of pickling to make Dill Pickles. One method is to pickle the cucumbers in spiced, flavoured vinegar. Jars of these pickles will be shelf-stable, unopened. The second is to ferment the cucumbers in a brine in which lactic acid develops using the flora on the cucumbers as a starter. This fermented style is more traditional. Jars of these must be kept refrigerated. There are two “sub-styles” to the fermented kind. Half sour dill pickles are brined for a brief time, then refrigerated. They will be less sour, crisper, and have a brighter-green skin than full-sour dill pickles which are brined longer. Another sub-style of Dill Pickle is the “Kosher Dill.” This does not mean necessarily indicate kosher, in the religious sense; rather, it indicates made in the style of Jewish Dill Pickle makers such as those in New York City, which is with garlic added. 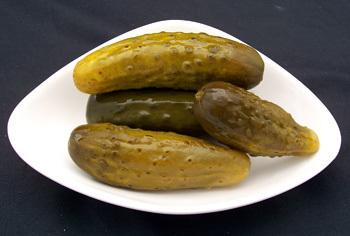 Kosher Dills will usually also be pickled using a fermenting process. At some snack bars, you can get Dill Pickles battered or breaded, and deep-fried. Dill pickles can be high in sodium, though lower-sodium versions are now available. “GERMAN PICKLES.—Take two or three dozen pickles (good-sized ones }, half a peck of small grape leaves and some dill; wash the pickles and leaves; take a small jar and lay in the bottom of it a layer of leaves and then of pickles, and a little dill; lay in alternate layers; make a salt water brine of very warm water, enough to cover the pickles; do not make it too salty; put a plate in the jar, and lay on it a heavy stone. In about a week the pickles will be sour. Try but a few for the first time; you may like them and you may not. I think they are very nice.” – Author not given. The Fresno Republican. Fresno, California. 19 July 1879. Page 6. — Ad placed by G. Seeligson & Co. Galveston Daily News. Galveston, Texas. 7 September 1885. Page 5. Ad in: The Dunkirk Observer-Journal. Dunkirk, New York. 11 January 1888. Page 4. “Heinz apple butter, very fine, 10 cents lb. Heinz dill pickles per dozen 10 cents. Favorite pure currant jelly, tumbler 12 cents. Pure strained honey, tumbler, 13 cents. Dedrick Bros.” — The Daily Gazette. Janesville, Wisconsin. 3 January 1901. Page 5. “A new pickle in H. J. Heinz ’57’ line, a processed dill, a crisp-skinned juicy one with a loud smack of dill in its flavor, packed in 25-ounce jars, sells in local groceries and delicatessens, in national distribution. This pickle, like all Heinz pickles, is a quality job. It has a homespun flavor and has been subjected to rigid kitchen and laboratory tests before getting into commercial production. Heinz is a firm not satisfied with the ordinary run of crooked little cucumbers so often found in home pickle crocks. Their horticulturists have developed a strain of cucumbers especially suited for the jar. These cucumbers have thin skins, are straight as toothpicks, tender-hearted, a pickle that can easily absorb the savors of spiced vinegar. The seeds of this pedigreed pickle stock are distributed by the Heinz Company to independent farmers in Michigan, Wisconsin, Indiana, Colorado, California, and Iowa, who grow the pickle harvest under contract. It takes about one and one-half months for the crop to mature, and during this period, Heinz field specialists are on twenty-four-hour call to answer questions or actually to pitch in and help the grower with any plant crisis. Different pickle varieties require that cucumbers be picked at different stages, and each day, as the cucumbers reach varying sizes, they are hand-gathered. The pickles are packed in special crates designed to prevent bruising and trucked to a near-by Heinz plant for immediate processing. Not only are Heinz cucumbers of top quality but so are the seasonings; spice-buyers for the firm cover the globe selecting the best grades of spices. Heinz’s own jewel-toned vinegars are used for the processing.” — Paddleford, Clementine (1898 – 1967). Food Flashes Column. Gourmet Magazine. July 1950. “Dill Pickle Rag”, written by Charles Johnson (1875-1950) in 1906, became a hit, with over 1 million copies of the sheet music sold. Grocery store ad mention of “German Dill Pickles” petered out around 1917 in America, perhaps owing to the First World War. The term reappeared a bit in the early 1920s, but mostly fell out of use. If a French, Italian, etc, recipe calls for dill pickles, it’s likely that that is a mistranslation and that a pickle such as “gherkins” is meant. Simone, Amy. Assistant Professor, Food Safety and Quality. Homemade Dill Pickles May Pose Risk of Listeriosis. In “Research News You Can Use”. University of Florida/IFAS Department of Family, Youth and Community Sciences. 3 January 2006. Kim, J.K., E.M. D’SA, M.A. Harrison, J.A. Harrison, and E. L. Andress. 2005. Listeria monocytogenes survival in refrigerator dill pickles. J. Food Prot. 68(11):2005, 2356-2361. Making Genuine Dill Pickles. PennState College of Agricultural Sciences. Topic 2153. 2006.